Republic recognized seniors from its basketball teams, cheer squad, and dance squad this week. Here are our senior tributes! Bailey Peabody was escorted by her parents, Ron and Sandra Peabody. She has danced for the Republic Tigerettes for three years. Bailey has a GPA of 3.8 and is a member of DECA, Yearbook, Key Club, National Honor Society, and the A+ Program. She plans to attend Pittsburg State University and study marketing. #2 – Megan Branstetter was escorted by her mother, Dana Essary, and brother, Zach Branstetter. 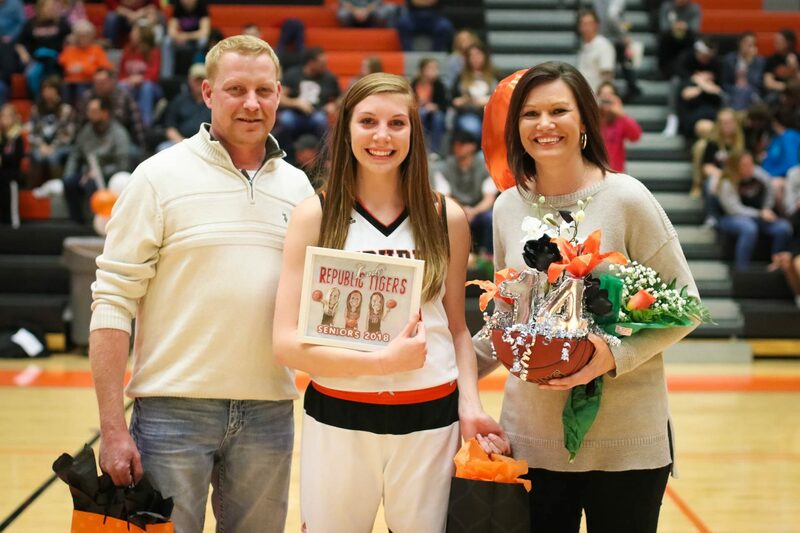 Megan is a point guard for the Lady Tigers and has played basketball at Republic for four years. She is a member of FCCLA and the A+ Program. Megan plans to attend Missouri State University and study architecture. #10 – Morgan McGuire was escorted by her parents, Michael and Stacie McGuire. Morgan is a guard for the Lady Tigers and has played basketball at Republic for four years. She has a 3.0 GPA and is a member of the A+ Program. Morgan plans to attend Missouri State University and study nursing. #14 – Brylee Manes was escorted by her parents, John and Misty Manes. Brylee is a guard for the Lady Tigers and has played basketball at Republic for four years. She has a 3.4 GPA and is a member of the A+ Program. Brylee plans to attend John Brown University and study business. Kaylin Glenn was escorted by her parents, Mike and Kristi VanWyk. She has cheered for Republic HS for four years. Kaylin is a member of the A+ Program. She plans to attend Missouri Southern State University and study early childhood education. Gretchen Ott was escorted by her parents, Ryan Ott and Rebecca Coffey. She has cheered for Republic HS for two years and has signed to cheer at Drury University next year. Gretchen has a 3.5 GPA and is a member of the A+ Program. Gretchen plans to attend Drury University and study elementary education. Caitlyn Sturgis was escorted by her parents, Darrin and Rebekah Sturgis. She has cheered for Republic HS for two years. Caitlyn has a 3.0 GPA and is a member of Spanish Club and the A+ Program. Caitlyn has signed with Drury University for cheer and plans to study pre-law. Jessica Werhan was escorted by her parents, Bryce and Amanda Werhan. She has cheered for Republic HS for two years. Jessica is a member of DECA and she plans to attend Missouri Southern State University and study hospitality and travel. Morgan Wojciechowski was escorted by her parents, Todd and Jennifer Wojciechowski. She has cheered for Republic HS for four years. Morgan has a 4.3 GPA and is a member of DECA, Key Club, Leadership Team, National Honor Society, and the A+ Program. Morgan plans to attend University of Arkansas and study marketing. #3 – Hunter Creek was escorted by his mother, Kimberly Jaworski. Hunter is a guard and has played basketball at Republic for four years. He is a member of the Republic tennis team and the A+ Program. Hunter is undecided on where he wants to attend college, but he plans to study law. Chandler Duryea was escorted by his parents, Shayne and Karla Duryea. Chandler has been a team manager for three years. He has a 3.2 GPA and is a member of FFA and the A+ Program. Chandler plans to attend Ozarks Technical Community College and study physical education. Dylan Girdley was escorted by his parents, Ty and Melissa Girdley. Dylan has been a team manager for two years. He enjoys hanging out with friends and playing basketball at the rec center. Dylan plans to attend Ozarks Technical Community College and then Drury University and study either zoology or athletic training.